In this third installment in her best-selling pictogram series, graphic designer Yang Liu brings the way we were face to face with the way we are. Through Facebook, food waste, concentration spans, and much more, Liu’s crisp visuals offer a lively, discerning distillation of our ever-evolving world, from the details of daily experience to the momentous happenings of history. 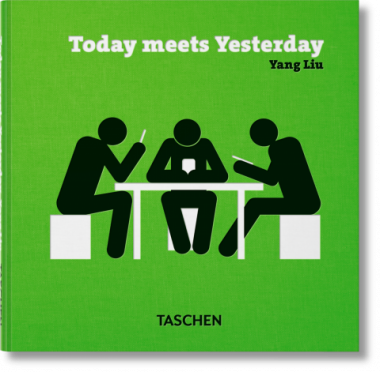 In this third installment in her pictogram series for TASCHEN, leading graphic designer Yang Liu brings the way we were face to face with the way we are. Hot on the heels of its best-selling predecessors, Today meets Yesterday deploys the same vivid pictogram pairings to explore the transformations, and the challenges, of our ever-evolving world. With an eye on everything from geopolitics to concentration spans, Liu’s panorama incorporates the details of daily experience as much as the momentous happenings in history. Through Facebook, food waste, collectivism, and much more, Today meets Yesterday casts the familiar situation in a crisp and discerning light, bringing fresh awareness, as well as some ironies, to who we are and where we came from.